When I was just a kid I always wore sweaters and dungarees (which I'm trying hard to forget). I was a huge Spice girl fan and Sporty was my favorite. Mel C was, in my option the coolest chick in the nineties. Her tattoos, nose piercing and Adidas tracksuits were so rebellious, so cool, she was my first and worst style Icon. One day I spotted a picture of her in de teenage magazine. She was wearing such a fabulous cropped sweater. I looked and looked in every clothing shop to find the same jumper or something similar but without any luck. Because of that I was so happy to see that both cropped and sweaters where making their comeback this winter season. In a short period of time I collected almost 30 different sweaters. Black, grey, red, purple, with print or embroidery, hand beading cropped, long, over-sized, with sleeves or without. I love them all!! They look nice on jeans, a leather pants or short skirts, with high heels or sneakers. And you know what is the best thing of all this……. they are sooooo comfortable. Normally for real fashion lovers comfortable is a 'smutty' word, it doesn't combine with looking good at all. But times are chancing, finally. But as a real fashionista I don't like to wear the same as everyone else in town. That's why i'm happy to find this website www.spreadshirt.nl. Here you can order your own customized sweater or T-shirt. Here's a tip: make one with your favorite fashion quote. 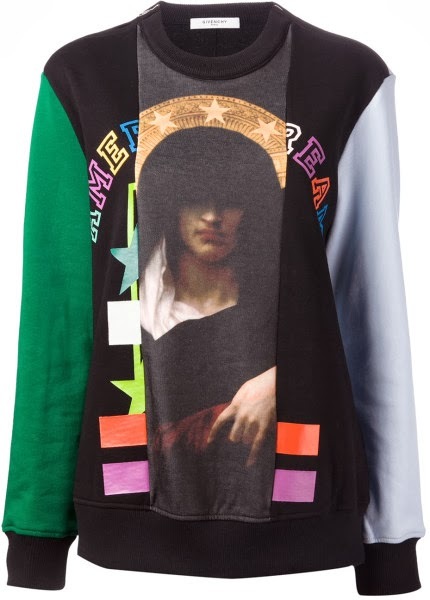 Still on my wish-list this winter is this lovely Givenchy sweater with college font and virgin image, see picture. What is your sweater wanna-have this season?